The Trump administration has announced that it will issue a permit for the Keystone XL pipeline, officially reversing the 2015 decision of the Obama administration. The pipeline still requires approval from the Nebraska Public Service Commission and landowners. The 1,179-mile pipeline would transport crude oil from the tar sands of Alberta, Canada to Steele City, Nebraska, and from there join existing pipe to travel to refineries in Texas. The construction of the Keystone pipeline would have definitively undercut the Obama administration’s environmental goals and the U.S.’s already frayed climate reputation; the Trump administration’s environmental goals being essentially “despoliation of the earth for cash,” however, this was clearly a no-brainer. Let’s take a quick look at a few of the controversies associated with the Keystone pipeline. First, Trump claims that the pipeline would create 28,000 jobs, which is a vast overestimation—the State Department under the Obama administration found that it would actually create 3,900 direct construction jobs if it was built over the course of a year, or 1,950 over two years. Once opened, the pipeline would only require 35 full-time jobs to maintain. 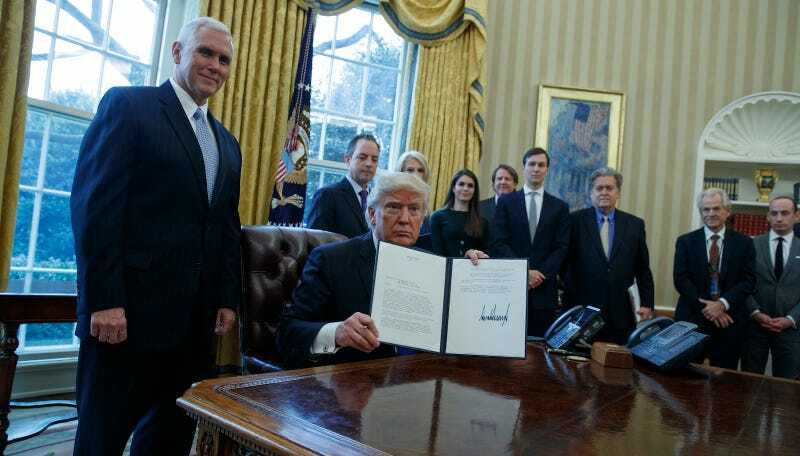 And despite the fact that Trump said the Keystone and Dakota Access pipelines needed to be made with U.S. steel “or we’re not building one,” the Keystone pipeline will not be made with U.S. steel because “the steel is already literally sitting there,” according to a Trump spokeswoman (also, Politico speculated, it could be helpful in persuading TransCanada to drop its NAFTA complaint against the US). Moving on to its environmental impact! As a 2011 ProPublica report explained, the proposed pipeline route would pass over the Sandhills wetland of Nebraska and the Ogallala Aquifer, which is relied upon by a number of Midwestern states. (Although the list of recent pipeline accidents in the U.S. is quite extensive, a University of Nebraska hydrologist posited in 2011 that the pipeline posed a minimal risk to the Aquifer as a whole.) The ProPublica explainer also noted the argument that tar sands “dilbit” is more corrosive than regular oil, and poses more of a risk for leakage. Oil sands crude generates more greenhouse gases than regular crude because of the energy it takes to extract; the State Department’s 2015 environmental review claimed the pipeline itself wouldn’t have a significant impact on emissions, but also argued that if oil prices remain low and the pipeline was not constructed, oil sands production could decrease. “The dirty and dangerous Keystone XL pipeline is one of the worst deals imaginable for the American people, so of course Donald Trump supports it,” Sierra Club Executive Director Michael Brune said in a statement on Friday.